I often wonder what the Little Lady will be when she grows up. Instead of having a room full of dolls, she has already amassed a bed full of cuddly animals that she treasures dearly. (Woe betide me if I try and steal any away!) 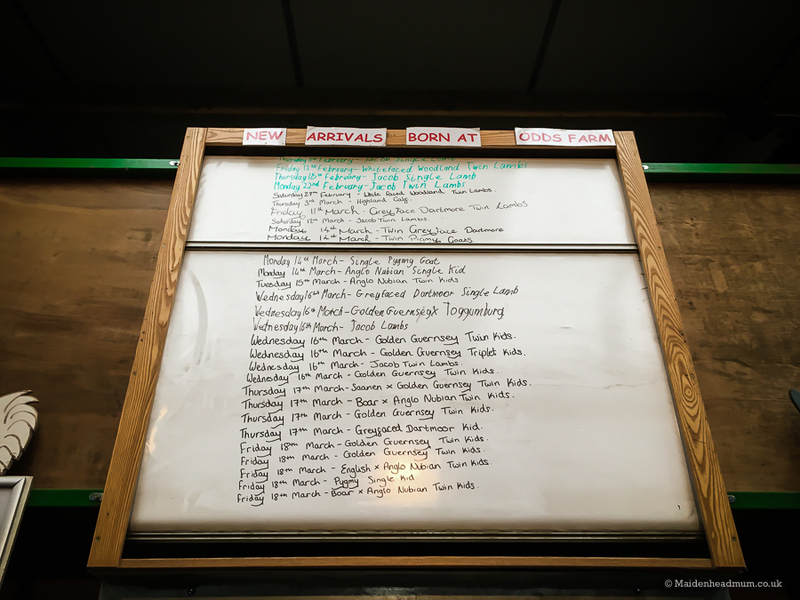 So when Odds Farm invited me to visit in return for a feature on the blog, I was keen to give it a go. 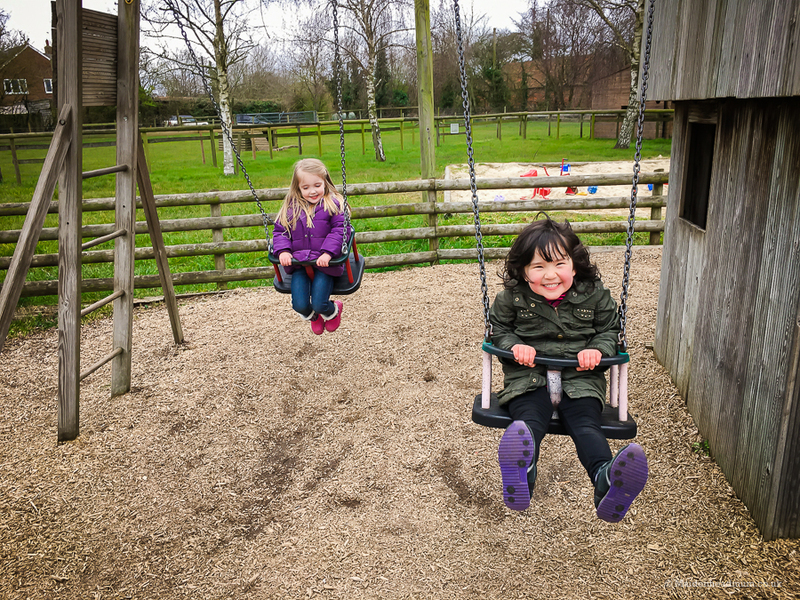 Although it’s the biggest children’s farm near Maidenhead, we’d only been once before when the little lady was much younger so it was good to have the chance to explore again now that she’s approaching her 4th birthday. 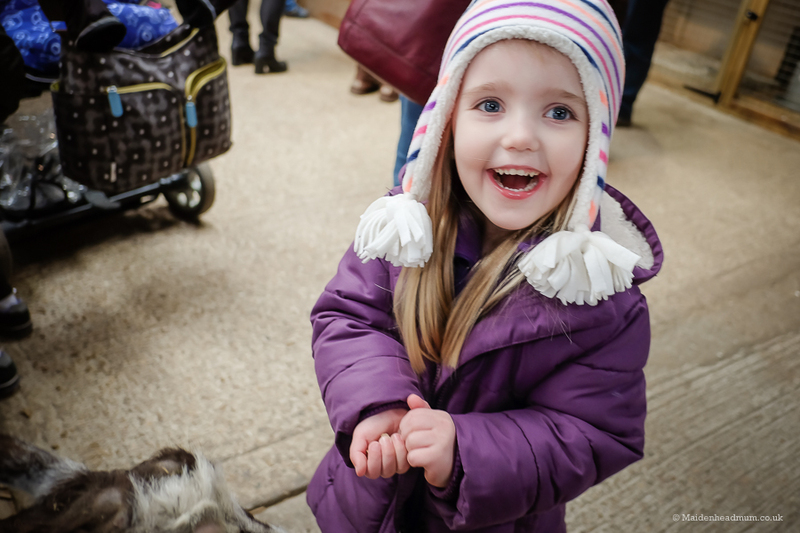 We went along one chilly Saturday just before Easter with her best friend and both of their baby siblings. 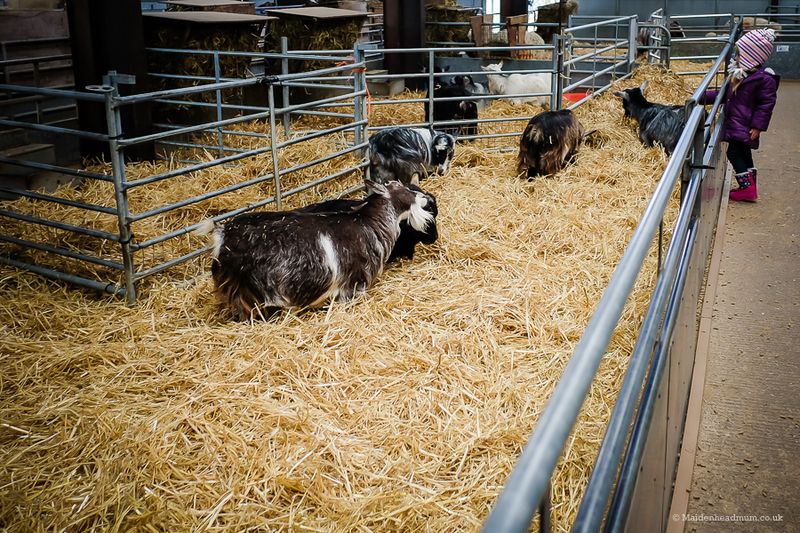 The farm is also pretty close to London so it attracts people from a wide area. 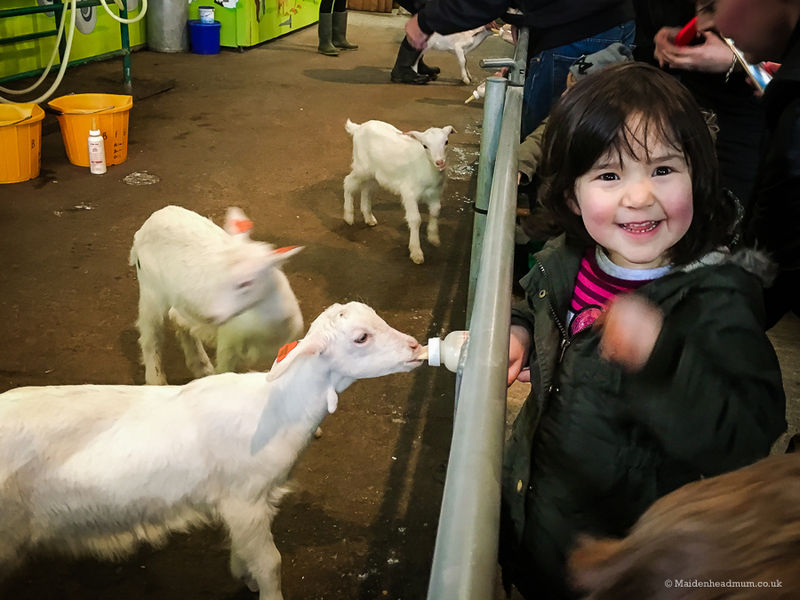 Despite all of our best attempts to be nice and early we arrived at 11.30am, but this was just in time for some of the ‘hands-on’ animal activities at the farm and the kids were able to stroke a rabbit and wait for the bottle feeding of the goats. It can get pretty busy, but everyone gets to have a turn. Although my daughter decided she didn’t want to do it and spent the whole time climbing up and down the seats instead! Best laid plans and all…! Easter is a lovely time to visit as it’s lambing season so you never quite know what you might see when you’re there. A little bit of Easter Magic could happen in front of your eyes. So many little babies being born! You might get lucky when you’re there. We arrived early for the bottle feeding of the goats and took our seats. 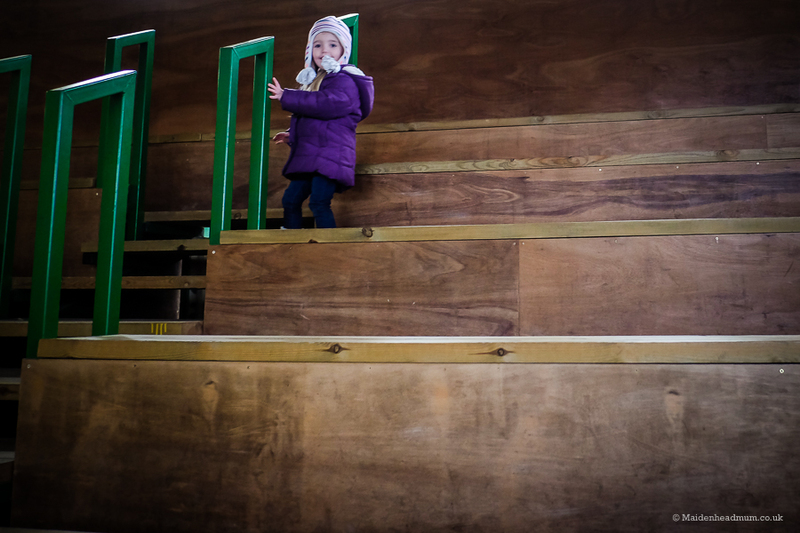 Although a certain little person was fascinated with climbing up and down. Her best friend was excited to feed the goats. You have to hold on tight, they have quite a pull when they’re hungry! 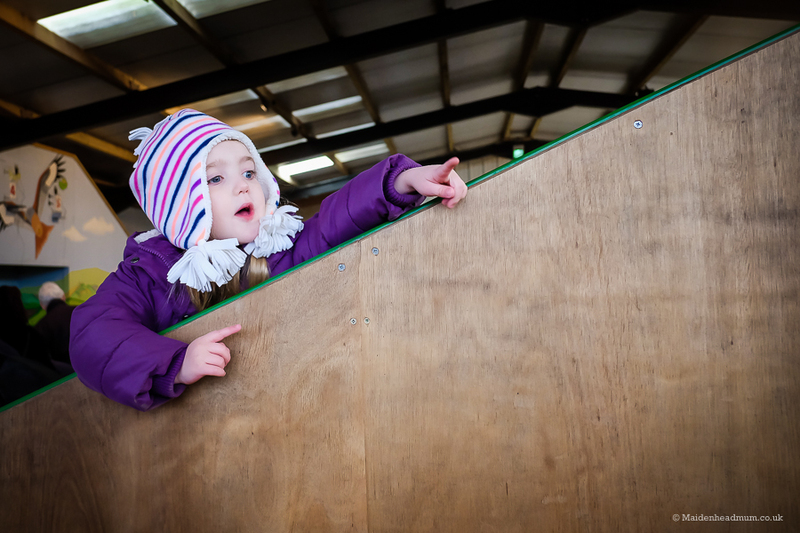 Meanwhile my Little Lady was pointing out all of the other animals that she wanted to go and see! 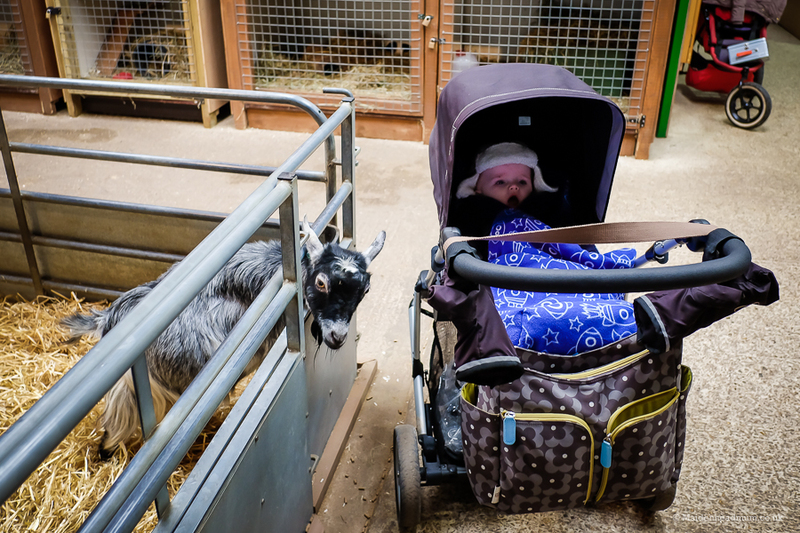 At Odds Farm, all of the animals are in a covered barn which means that you don’t get muddy walking around and it’s super easy to push the buggy around. You can also have a bit of fun playing ‘silly shoes bingo’, with extra points when you spot a pair of glowing white trainers! I purchased a bag of animal food from inside the barn and the girls enjoyed letting the sheep and goats feed from their hands and peeping at the huuuuuge pigs. 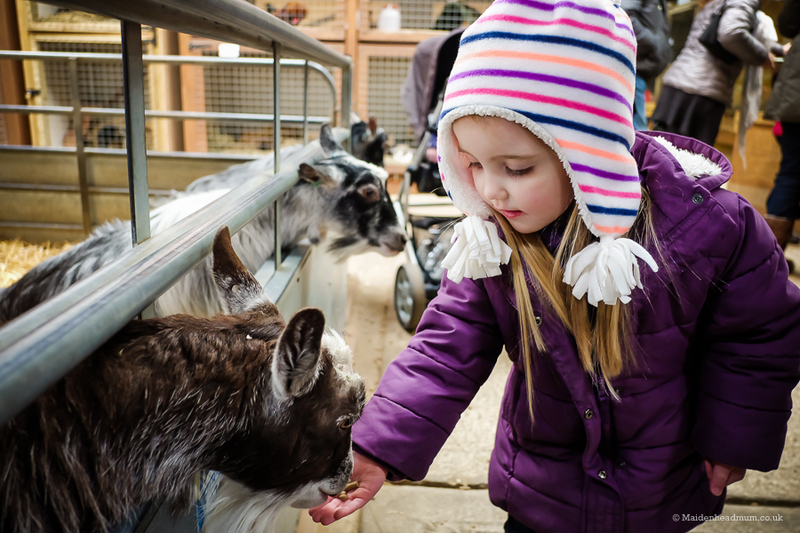 The children are encouraged to walk around and feed the animals. 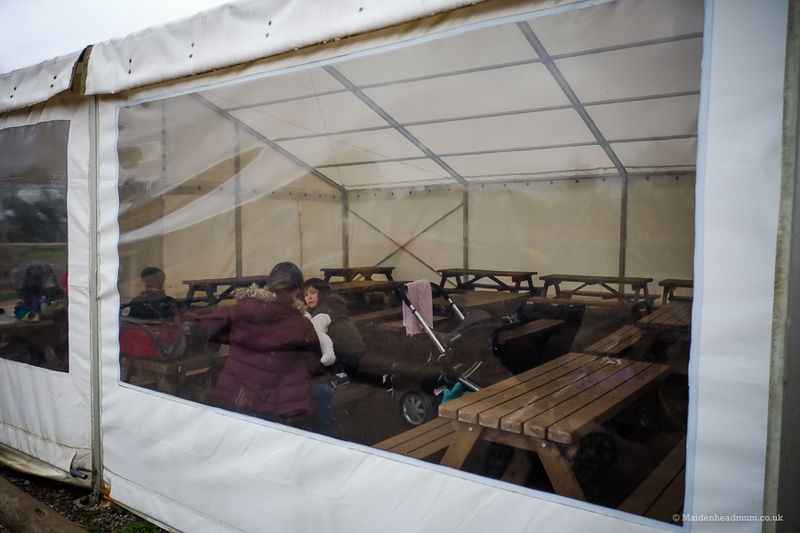 There is plenty of room to push the push chair around, although you can choose to leave them at the side and carry the kids around if that’s easier. 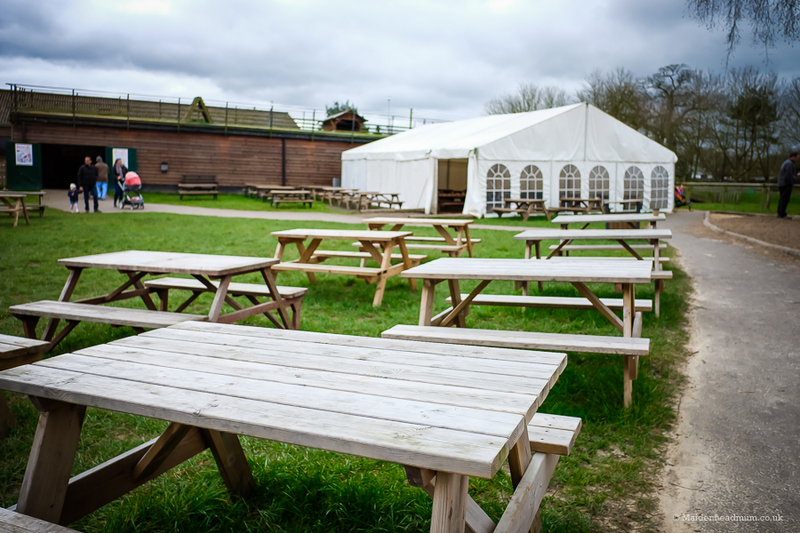 We had decided to take a picnic with us for convenience and it was good to see that Odds Farm have a covered area for you to sit outside if you want to as well as lots of picnic benches for warmer weather. In the summer I bet these picnic benches are really popular. 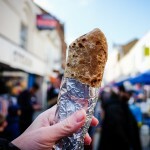 We ate our sandwiches outside knowing that we would be going into the warm cafe for tea and cake later on. 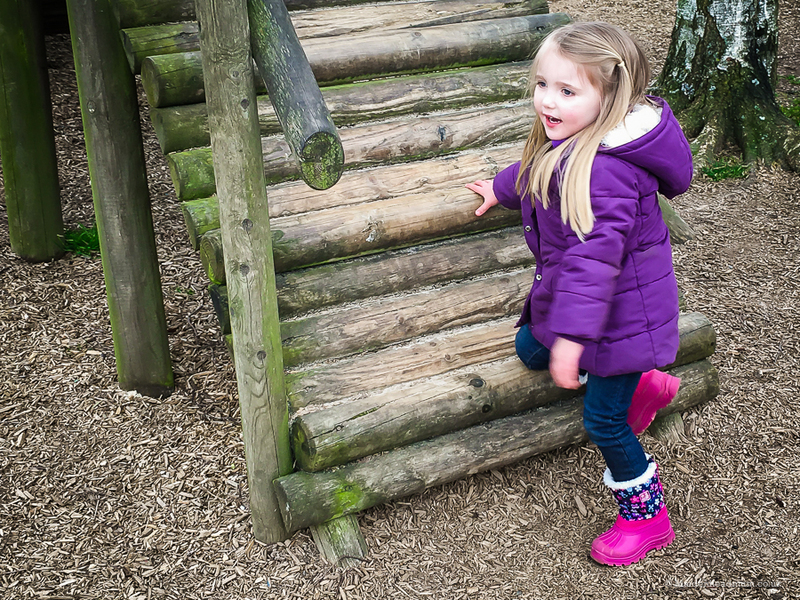 After the animals the girls were keen to explore the playground and spent aaaaages climbing, sliding and swinging. So much so that I had become pretty nippy standing around watching them by then and took myself inside to warm up, and feed the Little Man while my friend watched the Little Ladies carry on playing. Climbing and exploring. They were wrapped up warm so the lack of sunshine didn’t bother them. Although it was ‘a bit scary’, I felt the playground was just right for 4 year olds and above. 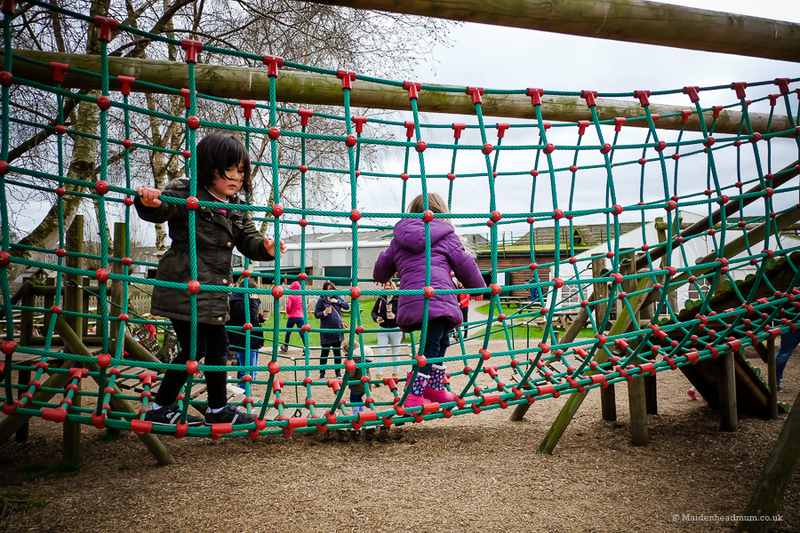 There is a smaller playground for younger children too. Attempting to push herself on the swing because she’s a ‘big girl now’. 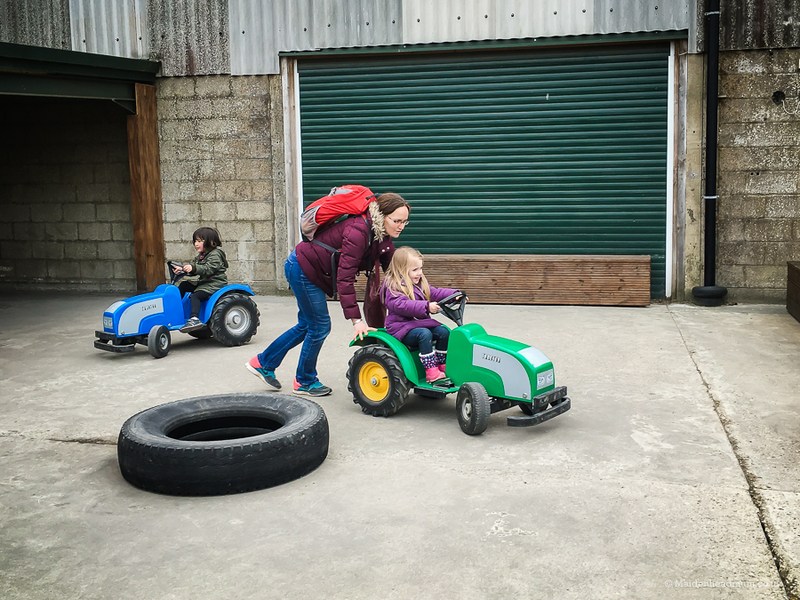 Next stop was the tractor rides which kept them amused. 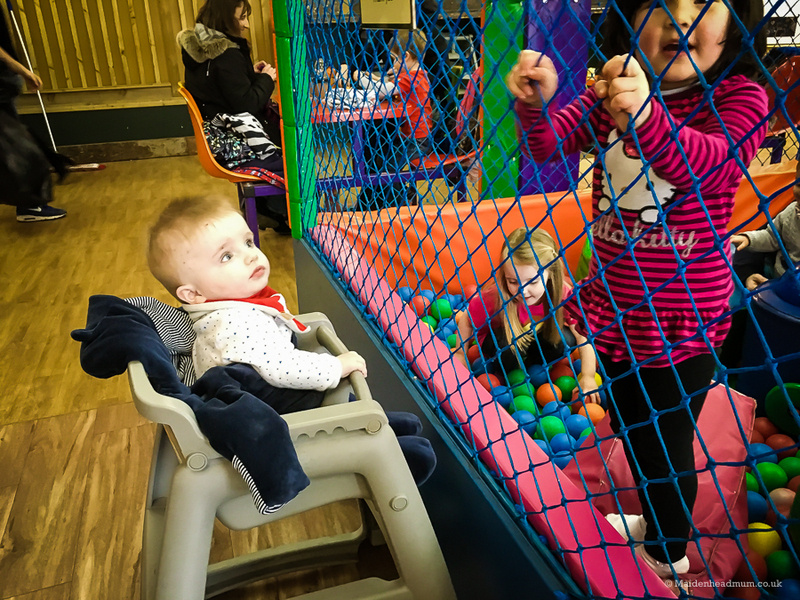 I figured that I would show them the softplay area last as they both LOVE exploring softplay. Once inside I knew that the odds of getting them off it were pretty small. I was right. Once in, they vanished and my friend and I were able to feed the babies and eat a slice of cake without any interruption! Lemon Drizzle Cake! AMAZING! and only £2.30 a slice. I ate it all before remembering to take a photo. Whoops! 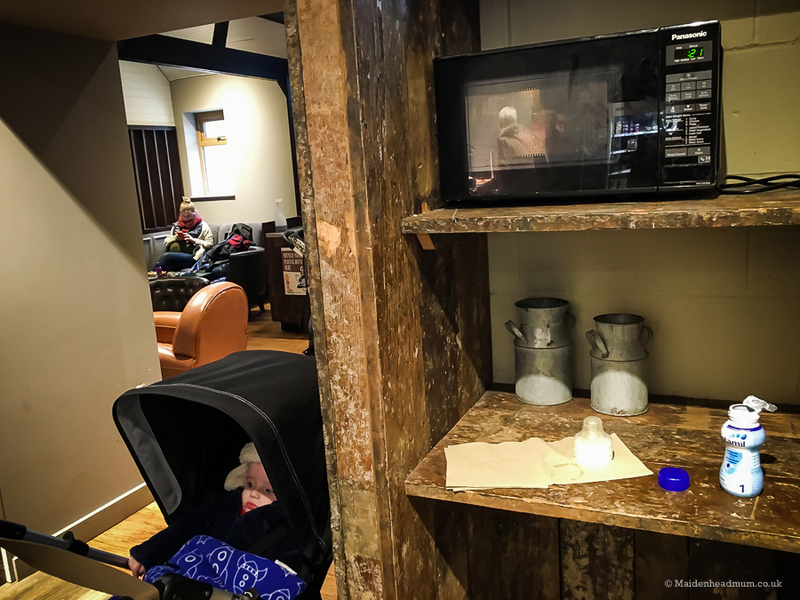 There is a microwave which you can use to warm up baby bottles and baby food. 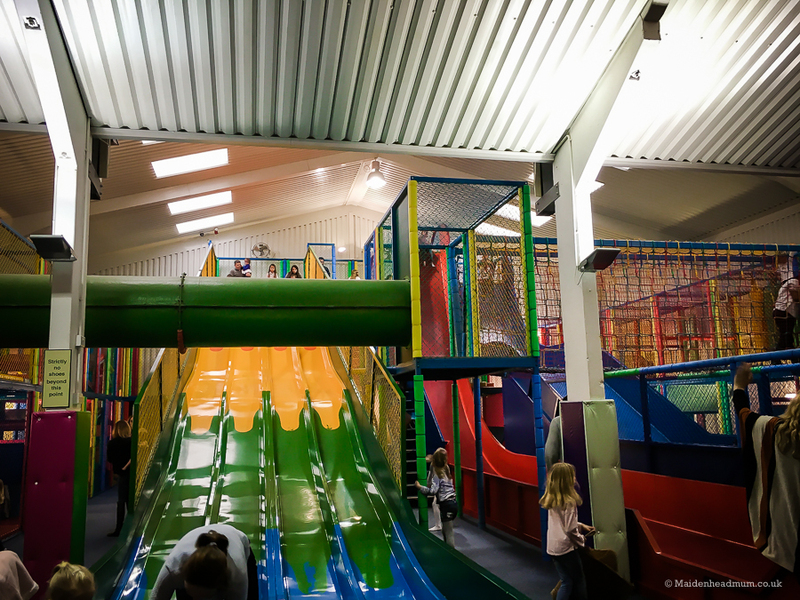 The soft play area is HUGE with some great slides for them to play on. 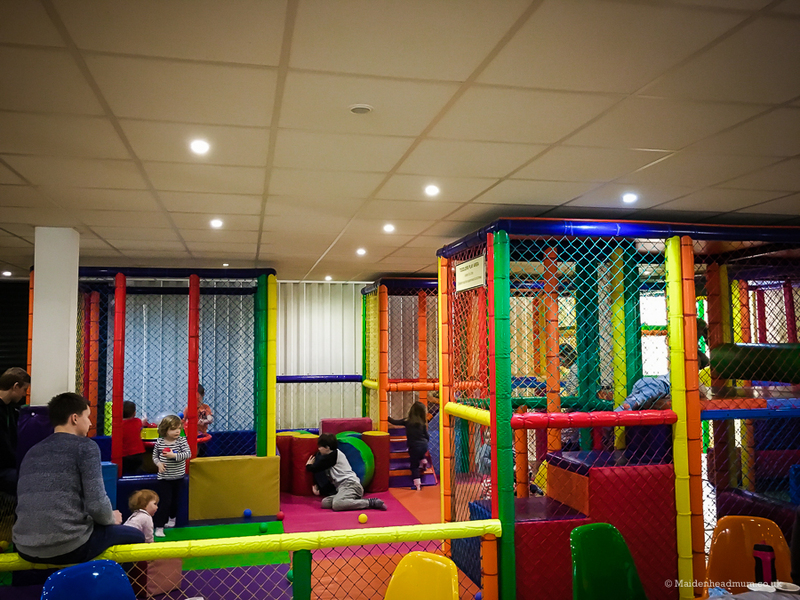 There is a smaller soft play area suitable for toddlers and under 5s, although our girls wanted to explore the bigger one instead. 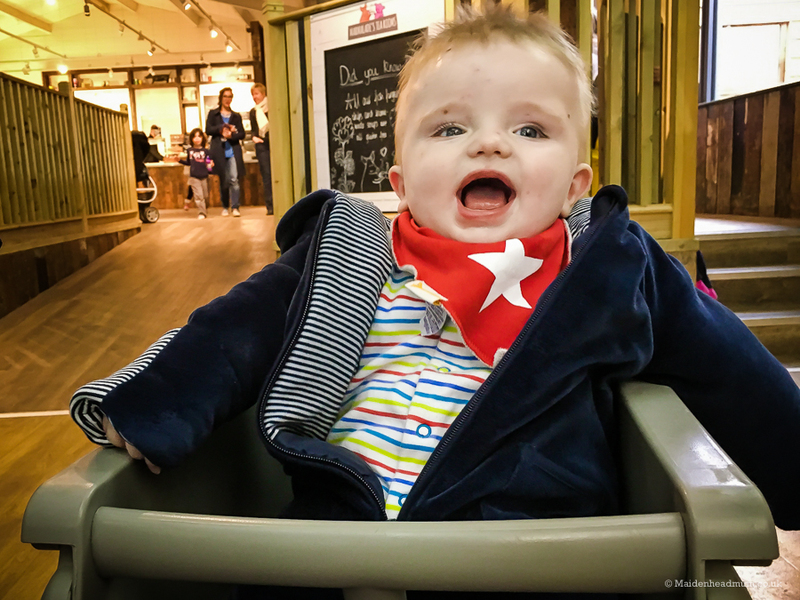 At 8 months, the Little Man is bit young for the soft play area so I found a high chair for him so he could watch what was happening. 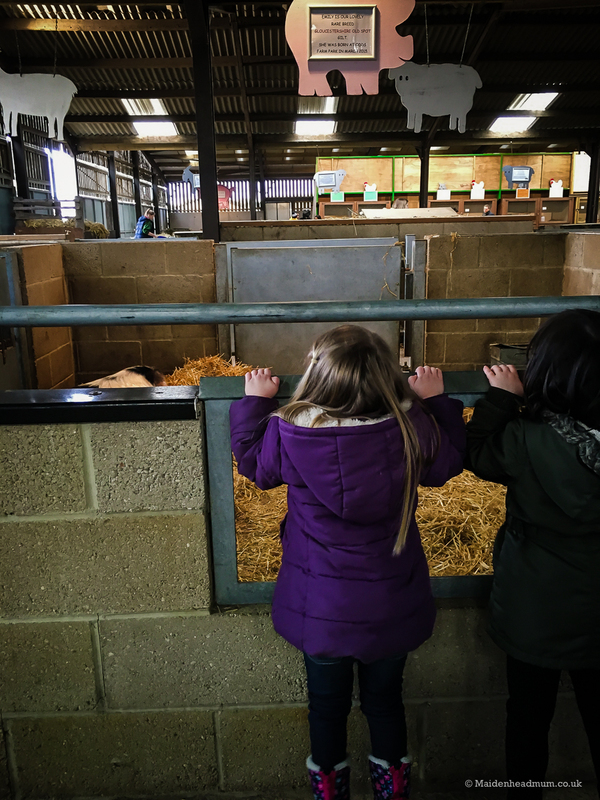 I think when the weather is cold and grey, you tend to discount visiting a farm as an option. Yet I was impressed with how many things they could do despite the average weather. Being nearly 4, I found she was much better suited to the farm than on her first visit at 18 months as she was happy to stay for most of the day exploring the different areas. We didn’t even get to see the mini golf, or go on a big tractor ride but we will give that a go another time. I think we can agree that she had a great time! The farm is just 6 miles away from Maidenhead and near junction 2 of the M40. There is plenty of parking on site when you get there. 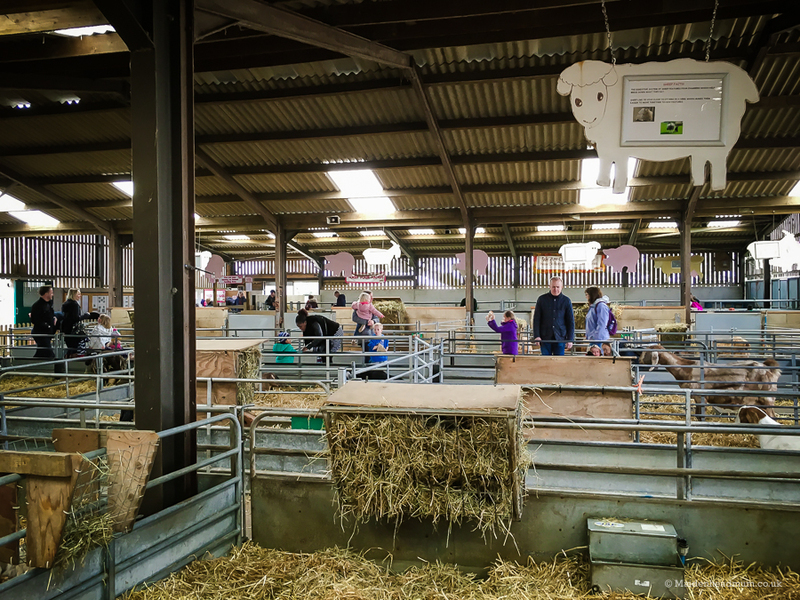 If you visit before the 10th April there are some extra Easter activities to take advantage of, including a chocolate trail around the farm and extra kids entertainment inside the play barn . 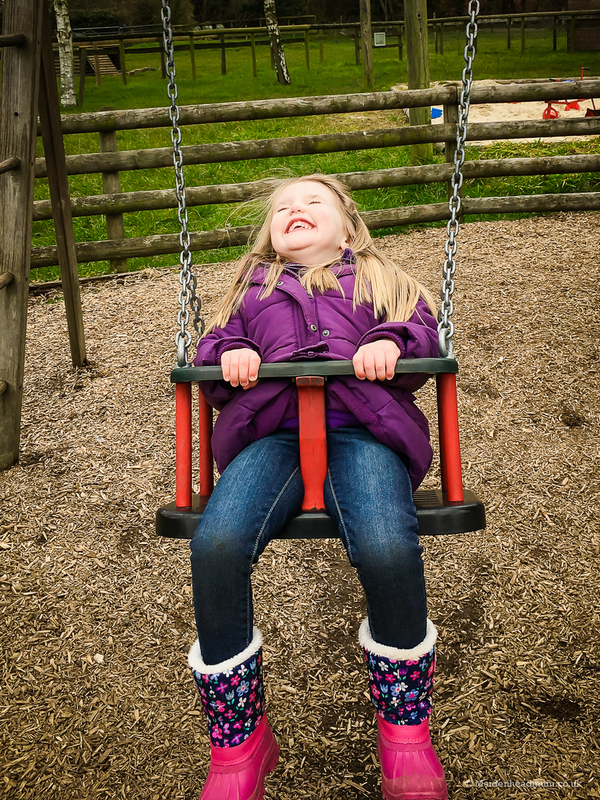 Children under 2 are free and adult tickets start from £10.50 on week days in term time. 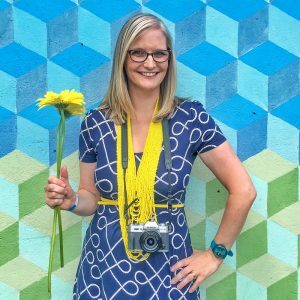 Although it’s not the cheapest kids activity around, I found that you can get good value by planning for a whole day out while you’re there. 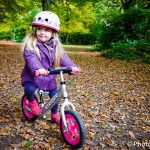 I’ve not been to many places in Maidenhead where the little lady was still running around with enthusiasm after 5 hours! 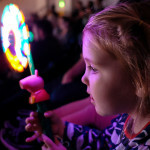 I was given a family ticket for 2 adults and 2 children in return for an honest review. As always with my blog, my opinions are my own and represent our experiences on the day. I write this ‘Maidenhead Mum’ blog to share my experiences of life here in Berkshire. It’s an independent blog which I write in my spare time. 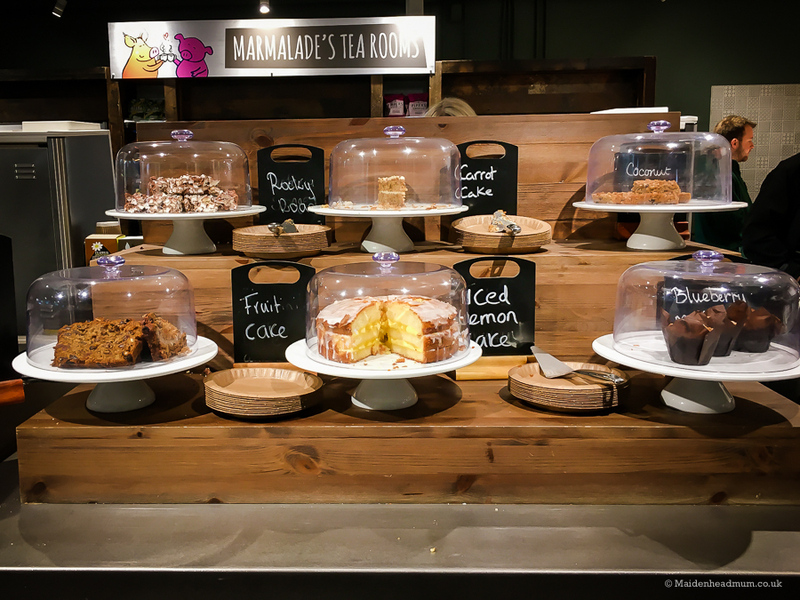 I think it’s important to help share and highlight some of the great things we have in and around Maidenhead. To read my posts you might like to join my Maidenhead Mum Facebook page. Or, if you subscribe using the box below you’ll get my posts delivered straight to your inbox.